Wedding is the most exciting and long awaited event for every couple, which requires thorough preparation. So, every minor detail should make it magic and unforgettable. Its easy to miss something on the hop. In order for this not to happen, we offer you to consider this theme for dressing up a wedding store, where all the essentials would be kept in one place. Once reaching it, the young marrieds will be introduced to the full range of crucial items they would need on their special day. Vibrant coral hues add a sense of festivity to this design, helping the viewers to concentrate on the things that matter. Comfortable organization of content blocks as well as the possibility to filter items the way one wishes makes the template even more usable. You can help couples with organization of their festivity by means of this theme. It is a attribute that helps to meet most customer and search engine requirements and reach ranking positions in the search. Using a SEO-friendly digital product, you will get the base to establish a significant cyberspace project that can be easy-to-find through the standard keyword phrases research. On top of that, you can make your web site achieve greater rankings in search engine results, thereby making it much more likely that potential customers will have a look at your website. It is the most popular HTML and CSS based framework that contains styles for the most important elements used in the HTML coding. Thanks to the use of Bootstrap a website will be able to adjust its content to any display resolution. It's necessary for both Search engine optimisation and website users. It's a web element which will help to set up a volume of data files storing the live demo content. Sample Data Installer lets adding and activating demo files in one or two clicks. Responsive design renders a web page exact properly on any display screen size. It is good considering that the website can be reached by more visitors from the vast amount of gadgets. Online chat along with tech support is really a sign for the potential customer - â€œthe following business enterprise really worries about meâ€. The potential customers don't need to wait many hours for their ticket being solved or proceed through tonnes of documents to find the answer for himself. Helpful tech support consultant will response him quickly and definately will fix his problem in a no time. Parallax effect is a solution in web design wherein the background website content moves slower than the foreground. Parallax permit your customers interact with your internet site and have significantly better visitor experience. It helps you to be noticeable among your opponents. I like the image from the PrestaShop template for Wedding Planner Services and would like to use it for my advertising campaign, can you send me this image in a higher resolution? No, we can't provide image in higher size or resolution rather than it is on the PrestaShop template for Wedding Planner Services. We recommend looking for professional images on online photo resources. Can I get the extended license for some other pricing than the half of the initial PrestaShop design theme for Fashion & Beauty Blog price? No. The price for purchasing license for a single PrestaShop design theme for Fashion & Beauty Blog is the half of the template unique price. Can I resell the PrestaShop theme for Society & People as is? No, you cannot resell the PrestaShop theme for Society & People as is. Can I apply a discount code to a discounted PrestaShop theme for Society & People Services or combine several discount codes together to get better price? Are there any limitations on selling the PrestaShop ecommerce template for Wedding Dresses as the integral part of my new product? I would like to make payment for PrestaShop theme for Wedding Shop by company check. Is that possible? Please use Skrill payment option. They accept payments by check.You can place an order for PrestaShop theme for Wedding Shop on the site under the name of the company and choose Skrill merchant system for making payment from the company's account. To initiate bank transfer, please create an account here - www.skrill.com, add the number of your bank account and verify it. After that, you can place an order on our website and choose Skrill on checkout page. When the payment is made, the product will be sent to your e-mail along with the invoice under the name of your company. Requests for a refund are accepted at www.template-help.com/tickets within the period of 2 weeks after the order of PrestaShop theme for Society & People is placed. You should accompany this request with detailed and grounded reasons why you apply for a refund. Please make sure your request does not contradict the terms and conditions specified in the policy. A refund is issued to you upon receipt of a Waiver of Copyright signed by you. Can I use graphics from Wedding Ceremony Items PrestaShop design theme I purchased for use in printing? Yes, it's not prohibited to use the Wedding Ceremony Items PrestaShop design theme graphics for printed material, but the resolution of the templates graphics ( except for logo templates) is not enough for printing. I have customized the Society & People Support PrestaShop ecommerce template and would like to protect my content by copyright, can I place Copyright, Mycompanyname.com? After Society & People Support PrestaShop ecommerce template purchase you can put your copyright to the template. But you cannot place a line at the bottom (or any other spot) of the customized project saying "Website design by Company name". Nevertheless, you can place "Customized by Company name". What is Developers License for PrestaShop design for Family? If you purchase a Developer's license, you are granted a non-exclusive permission to use the PrestaShop design for Family on up to 5 domains for projects belonging to either you or your client. Can I get the PrestaShop theme for Society & People in higher resolution to use for printing? No, we design PrestaShop ecommerce templates for Bridal Magazine optimized for web resolution only. 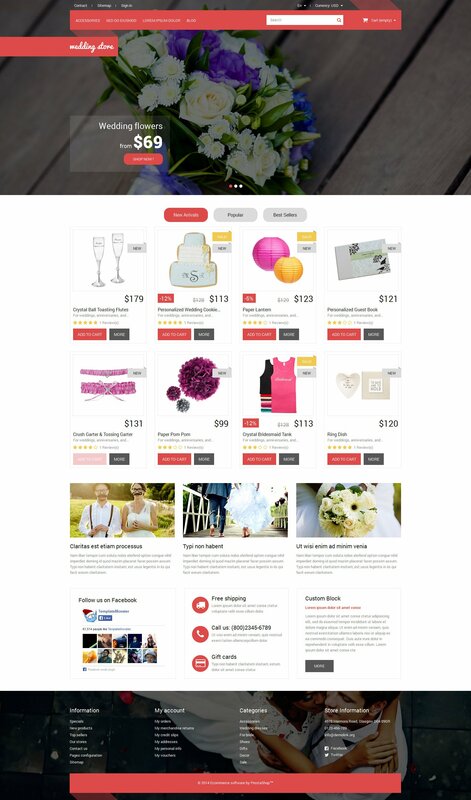 Will TemplateMonster help me to edit my PrestaShop theme for Wedding Shop? TemplateMonster offers you a variety of sources to help you with your PrestaShop theme for Wedding Shop. Use our comprehensive Online Help Center to get the basic knowledge about your PrestaShop theme for Wedding Shop. Our Knowledgebase contains customers questions and most frequent problems. Anyway, you can always use TemplateMonster 24/7 phone support, try our Ticket System or Live Support Chat to get qualified assistance from our support representatives. How many applications, programs etc can I use to integrate with the PrestaShop themes for Home & Family under one extended license? The extended license gives you the right to use the purchased PrestaShop themes for Home & Family for the integration with one software/freeware/application/CMS/sitebuilder only. In case you would like to use the template with the other application, the other license is to be acquired. Is it possible that Template Monster will contact my client which website I made from Template Monster's website Bridal Accessories PrestaShop design theme? Yes, our legal department checks licenses regularly. In case we won't find designer's contact information on the site which was made from the Bridal Accessories PrestaShop design theme of ours we will contact the owner of the site directly. Do you provide any scripts with your PrestaShop design themes for Wedding Planner or could you do some custom programming? Our templates do not include any additional scripts. Newsletter subscriptions, search fields, forums, image galleries (in HTML versions of Flash products) are inactive. Basic scripts can be easily added to a PrestaShop ecommerce theme for Home at www.TemplateTuning.com If you are not sure that the element you're interested in is active please contact our Support Chat for clarification. What is a unique purchase license for Fashion & Beauty News PrestaShop ecommerce theme? If you purchase the product at a 'Unique price' it guarantees that you are the first and the last person to buy this Fashion & Beauty News PrestaShop ecommerce theme from us. It means that this template has not been sold before and you become an owner of a unique design. After this kind of purchase the template is being permanently removed from our sales directory and is never available to other customers again. The unique purchase license allows you to develop the unlimited number of projects based on this template, but the template should be customized differently for every project. I ordered a PrestaShop template for Wedding Accessories but haven't received the download information. In case of not receiving the download information of a PrestaShop template for Wedding Accessories, please contact our Billing Department via support chat by phone or e-mail. Can I put a line at the bottom (or any other spot) of my new product "Website development by Company name" after purchasing Fashion & Beauty Blog PrestaShop template? Yes, you can place a note at the bottom (or any other spot) of my product "Website development by Company name". Nevertheless, you cannot place "Website design by Company name" while using one of Fashion & Beauty Blog PrestaShop template. Can I put low resolution thumbnails of Home & Family Services PrestaShop designs on my website for my clients to choose designs? What are the advantages of purchasing a Family PrestaShop design theme? The major advantage of purchasing a Family PrestaShop design theme is price: You get a high quality design for just $20-$70. You don't have to hire a web designer or web design studio. Second advantage is time frame: It usually takes 5-15 days for a good designer to produce a web page of such quality. Can I resell Fashion & Beauty Store PrestaShop designs I bought the developers license for? You cannot resell the customized PrestaShop ecommerce template for Wedding Salon as a template, but you may sell it as a project to your client. Is it possible to reactivate my download link for PrestaShop ecommerce theme for Fashion if it was deactivated after 3 days? Yes. Please re-activate the download link for PrestaShop ecommerce theme for Fashion within your account under the Downloads tab or contact our billing department directly regarding that. Excellente template. Template pour Prestashop 1.5 mais fonctionne tr&egrave;s bien sur la version 1.6. Attention &agrave; toutefois l&#039;installer sur la version 1.5 et de faire ensuite un upgrade vers la version Prestashop 1.6 Quelques configurations n&eacute;cessaire, notamment au niveau du slider mais rien d&rsquo;anormal. Simple et efficace. Template fid&egrave;le &agrave; la description. Les donn&eacute;es de d&eacute;monstration ne correspondent toutefois pas mais &ccedil;a ne g&ecirc;ne en rien.